The research team had a good sense of the relative lightfastness of the Orasol dyes as a result of the renovation research, but how long could we expect the dyes to last inside an actual diorama environment? 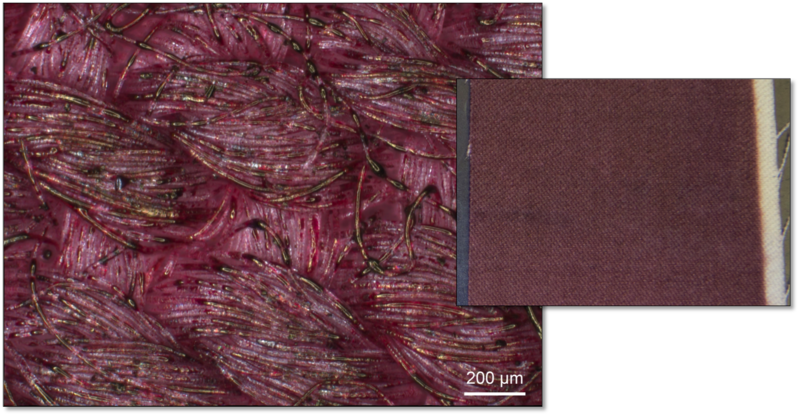 How could we better understand the ease of removal of the dyes from the animal hairs – is there a way to manipulate the dyes’ ability to penetrate or “fix” to the substrate? Could the dyes potentially cause the hairs to degrade faster inside the harsh diorama environment, or do they block the light and slow down damage – or both? These questions acted as the foundation to the current collaboration and the focal point of the project research. Since beginning the project last fall, the majority of the work to date has focused on questions concerning lightfastness. The research team has decided to narrow future investigation to the Orasol line of dyes, rather than bringing new materials into the research plan. While the research team also looked into water soluble dyes, fiber reactive dyes, other metal-complex dyes, and some acid dyes, we were the most interested in applications that minimized the use of water. Many of these alternative colorants are water-soluble and not appropriate for use on water-sensitive materials, require rinsing to remove excess dye and dye-bath residues, or their appearance during application does not represent their final color. The Orasol dyes remained the most promising among the materials available, as they lack the major drawbacks of some of the alternative colorants. 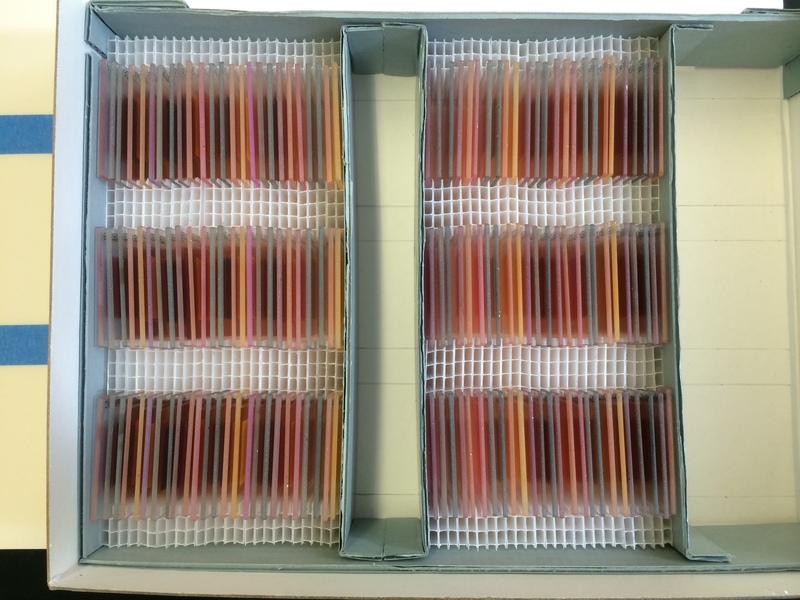 The experimental work began in late summer 2014, starting with a large amount of sample preparation. The first phase of the research plan tackles the question of how resistant the dyes are to fading – determining the lightfastness according to established standards (ASTM D4303) when applied without a binder or substrate that might interact with the dye. The testing done during the renovation project used wool flannel, an unstable substrate that also can discolor when aged, which could complicate being able to detect color change of the dye. For our current round of tests, we are replacing the wool flannel substrates with quartz plates, an inert substrate not expected to interact with the dye. The plates will be prepared according to methods used for testing in the paint industry – we’ll get into more detail about sample prep in future posts. Lightfastness test results will allow colors to be ranked and ASTM lightfastness ratings to be assigned to each dye color. 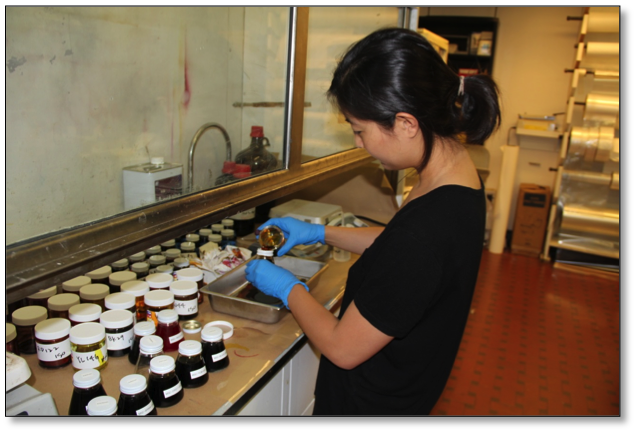 Intern Ersang Ma preparing dye for application to quartz plates. Additionally, we will be developing an aging protocol that mimics ASTMD 4303, but more closely reflects the UV-filtered light conditions, temperature, and RH that are recorded inside of the AMNH habitat dioramas. This will give us a ranking of the dyes when exposed to an environment that is more similar to what the taxidermy is experiencing inside the diorama. 150 quartz plates with dyes dissolved in various solvents and airbrushed onto quartz plates for the first round of lightfastness testing. On going color measurements throughout both tests will let us better characterize the rate of color change – then we can give projections about how the dyes will hold up over time in our diorama lighting environment. Our initial light dosage calculations indicate a rough equivalence between 1 day of exposure in the environmental aging chamber at these test standards, and 1 year inside the most brightly lit dioramas. We will also be looking into what impact, if any, solvent choice has on lightfastness and the rate of color change. Early testing during the renovation project suggested that not only can the color appearance of these dyes differ when they are applied in different solvents (as illustrated in the images below), but that the solvent choice may also affect lightfastness. 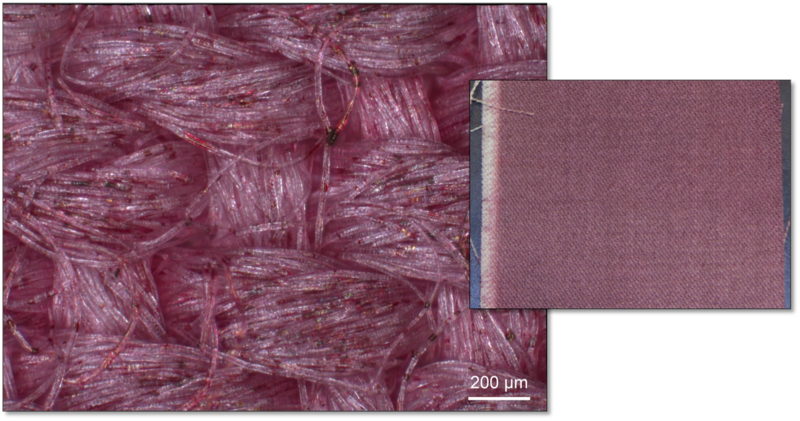 A 1% solution of the Orasol Red BL dye in MEK (methyl ethyl ketone) applied to wool textile. The dye is unevenly distributed and with distinct droplets. On the macro level, the swatch is a dark mauve. A 1% solution of the Orasol Red BL dye in methanol. The same dye delivered in methanol results in a more level film and a brighter color; the darkening you see is a product of higher hairs catching the airbrush more and getting more deposition. A 1% solution of the Orasol Red BL dye in PGME (Propylene glycol monomethyl ether). The dye seems to be pulled through the interstices of the weave. In fact, if you flip the fabric over, the color looks the same on the front and the back. Variations in how the dye is deposited on the substrate might influence the lightfastness of the dye – our initial accelerated aging testing will include dyes in five common solvents. In addition to tests of the dye on quartz plates, we also need to test the dyes on fur in order to better understand the rate at which we might expect recolored taxidermy to fade or discolor. Accelerated aging tests will be conducted on samples of mounted fur, and the final selection of colors, solvents, and testing conditions will be based on the results from testing the quartz plate samples. From a long list of fur initially considered for testing, examples were narrowed down to only bison, fox, and deer hairs to represent wiry, slick, and hollow-haired fur-bearing mammals. We then had to develop a mounting system that could secure the fur samples against disturbance from handling and air turbulence. 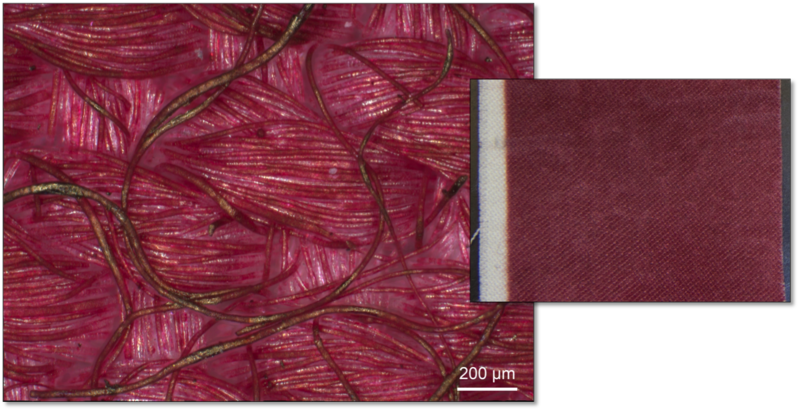 It was a challenge to trap both ends of every fiber so that they can be dyed in place while still being able to reliably take consistent color measurements of the same surfaces over the course of testing – hairs mustn’t dislodge because once they are dyed, a lost hair would expose the undyed hairs below and skew the color change measurements. We’ll reveal our mockups and final mount method in our post about sample preparation! Paul Whitmore watches Alan J. Boerke, a representative from the Q-Lab Corporation, during a training session at AMNH in February 2014. 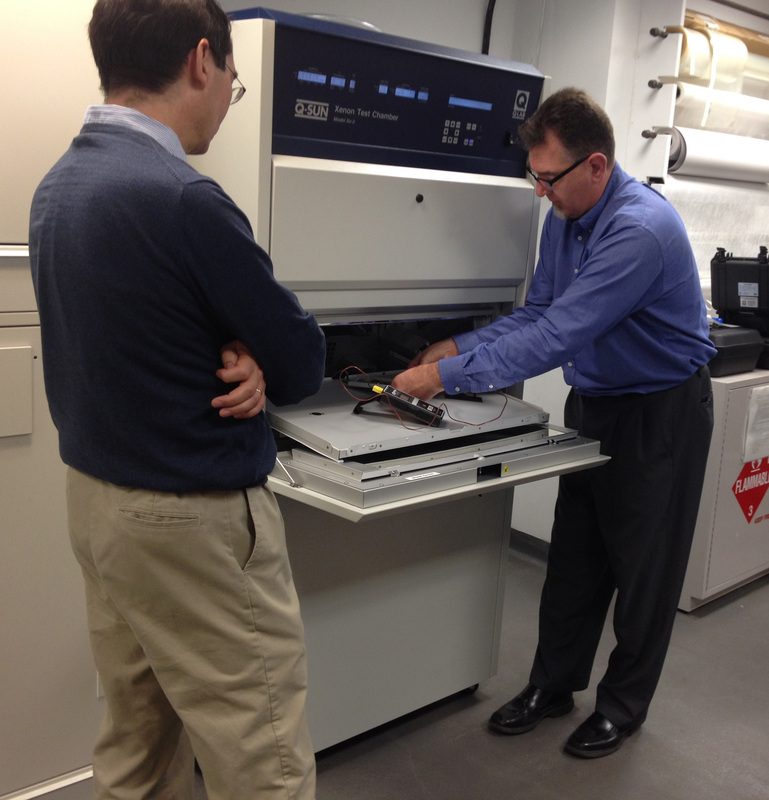 For the lightfastness testing during the renovation project, we were able to partner with the Art Conservation Department at Buffalo State College to utilize their artificial aging chamber and spectrophotometer. In support of our current in-depth investigation, the grant funds allowed the AMNH to purchase several major pieces of equipment, including a Q-Sun Xenon Arc Accelerated Aging Test Chamber Xe-3 and an X-Rite Ci62 handheld spectrophotometer. Installation of the aging chamber posed some of greatest challenges in planning, and required extensive assistance from the museum’s plumbers, electricians, and carpenters from our facilities department. We’ll get into some the details of those challenges in a future post. Over the last several months of planning, we’ve also discovered that it is difficult to obtain small quantities of the BASF Orasol dyes. Few retailers market them, and those that do carry stock that may be many years old. Other retailers use the Orasol name to sell related dyes manufactured by other companies. The true chemical and behavioral equivalence of these dyes is unknown – two dyes with the same name but different manufacturers may have differences in color, solubility, or lightfastness, among other traits. BASF has added and discontinued colors in their Orasol line over time – currently the line includes 26 colors. The previous testing as part of the renovation project included about half of the colors available – we are working to procure samples of all 26 colors. The upcoming lightfastness testing will include both new and old BASF Orasol dyes, as well as related non-BASF dyes – a total of 46 colors in 5 solvents. And that’s just the lightfastness testing using the aging chamber! We’re expecting these initial cycles of testing to begin next month and continue through the fall and winter, and we’ll be making adjustments to the total number and types of samples to be tested along the way. There are some other avenues of testing we will be conducting, including investigating the rate of color change under real diorama lamps (as opposed to the xenon lamps used in the testing chamber), as well as exploring the possibility of being able to manipulate dye penetration and investigating the long-term effect of dyes on the hair itself.